Also known as Drift Items. 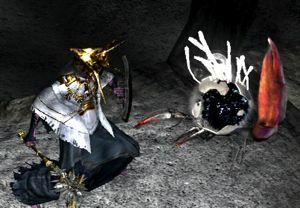 Vagrants are rare monsters that appear in specific places after other players have died and lost a large amount of humanity, or have dropped certain items. They are typically created unintentionally and randomly by other players online. The Good Vagrants look like an egg with legs, and will flee from the player and disappear just like Crystal Lizards. They do not have any attacks. Evil Vagrants have pincers, making them look like a crab monster. They have a weak melee attack, but also a dangerous projectile attack (vaguely resembling a Homing Soulmass) that will sometimes kill players in one hit. Both Vagrant types are easy to kill as they have low defense and HP. Avoiding the evil Vagrants' projectile attacks or finding the good Vagrants before they flee and disappear are the only real challenges presented in defeating them. The red versions of the vagrants are also known "black phantoms", sharing the phantom type of red invaders and Gravelord Black Phantoms. Unlike their counterparts, they dissolve when they die instead of leaving a corpse. Evil Vagrants are the result of unretrieved humanity being lost. If a bloodstain containing 5 or more soft-humanity isn't picked up by a player before they die, a Vagrant will be sent to another person online. An Evil Vagrant that someone fails to kill will continue to be sent to another random player each time it's abandoned. Good Vagrants are the result of Drift Item Bags that have passed around 10 or more times without being picked up. A Drift Item Bag is the result of players dropping and abandoning certain items. Once abandoned, a Drift Item Bag will appear for another player in the exact same location. If the drift item bag isn't found and picked up by its recipient, it is sent out again to another world. Like the Evil Vagrant, a Good Vagrant that isn't killed will continue to be sent to more worlds each time it's abandoned. This includes when a player scares off the Good Vagrant and it disappears. Note that proper methods for abandoning an item includes anything that causes an area to unload and reload (dying, homeward, dark sign, or even traveling far enough away and returning). Players cannot directly spawn Vagrants for themselves, though it is possible for someone to have their Drift Item Bag or Vagrant return to them after someone else retrieves and then abandons them. Anyone wishing to see a Vagrant in their world can improve their chances by continually seeding other players' worlds with Vagrants, to increase the likelihood of having one come back. This requires abandoning stockpiles of 5+ soft-humanity (for Evil Vagrants), or dropping 1 of something that creates Drift Item Bags (for Good Vagrants), repeatedly. This method works better for the Evil Vagrants, due to the initial Drift Item phase the Good Vagrants require. Drift Item Bags and Vagrants do not spawn spontaneously. They are initially received in an "incoming" queue, and will spawn immediately after the next time the player reloads that area (e.g, dying). Killing a Vagrant or picking up a Drift Item Bag will initiate a timer that may freeze anything entering the queue afterwards, impeding their reception or delivery. The timer takes 80 minutes to clear. Though Drift Item Bags appear in the exact spot that other players drop them, both types of Vagrants have fixed spawn locations. Similar to how invader spawn locations work, Vagrants will wind up at the nearest corresponding location. Depths Good In the narrow corridor leading to the fog gate, in the side path just before the 1st pitfall. Depths Good In the corner terrace near the entrance to the Gaping Dragon fog gate, two floors above ground level. Crystal Cave Good On the straight, invisible path leading towards the lower Crystal Golem. Chasm of the Abyss Good On the lowest outcrop in the area with the descending paths (near the Alvina/ Sif area). 2. This includes the first 10 passes as a Drift Item Bag for the Good Vagrants.